Having the ability to foresee the future, in all its ubiquitous glory is, of course, ambitious but possible. If only we knew what would happen, we can clearly avoid repeating mistakes and we can easily make elaborate plans that will take us one step closer to success and happiness. Life can only give us hints and we can only have gut feelings. But sometimes our instincts mislead and we can’t decipher any hints, so we anticipate. Certain creatures, not limited to human beings, possess the capacity to anticipate or to do mental time travel. In order to anticipate the future, the mind must travel to the past to relate and evaluate experiences, actions, or habits that produce a certain event or situation. In this fleeting moment, characterized by high hopes and optimistic longing, one recognizes the purity of one’s desires. It is pleasurable and intoxicating, taking us deep to our innermost thoughts where our expectations are free from doubt and regret. This phenomenon has been a constant motivating force of change. In their first solo show, Thursday Room presents “See You Later”, an anticipatory glimpse into what the future holds if they could only pay enough attention to the present. Looking through predictable patterns that unconsciously affect one’s stimuli, the artists flourish in their own niches. 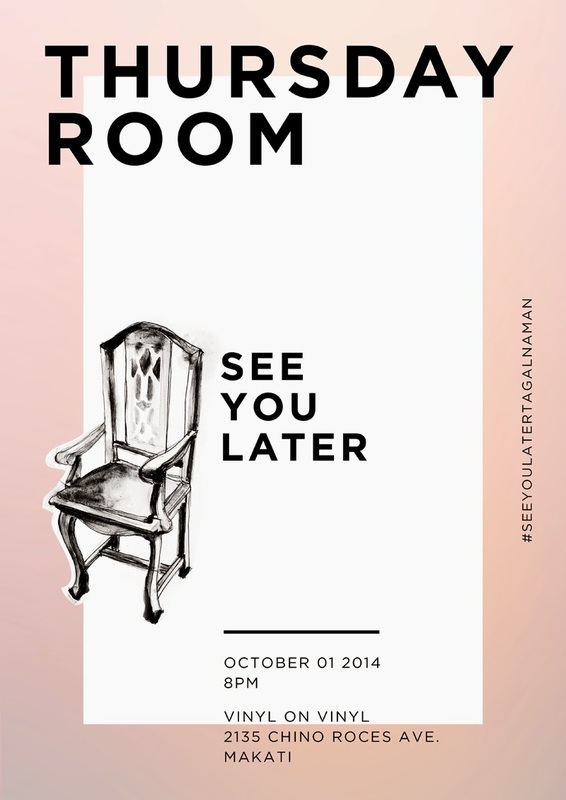 Thursday Room is Chi Jihan, Eldzs Mejia, Fold Canela, Jill Adolfo, Kris Abrigo, Soleil Ignacio and Tokwa Penaflorida.